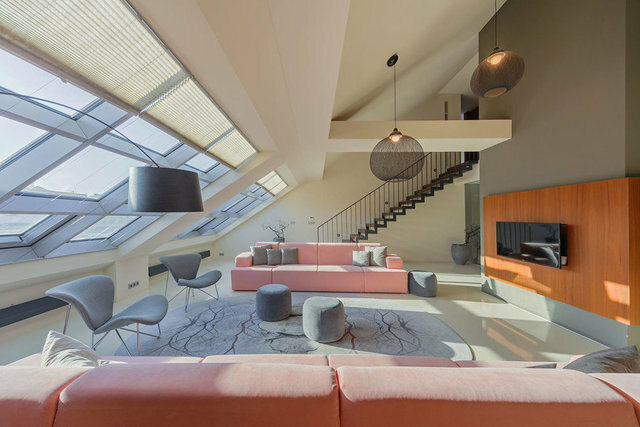 This loft apartment located on the top floor of a four-storey renovated building with a lift is situated in the centre of the New Town, not far from Jindrisska vez (Henry’s Tower). The spacious and sunny interior with clean lines and large-format atelier windows is fully furnished with modern amenities. Over a total area of 310 sqm there is an open lounge area with a loft gallery and fully equipped kitchen. Also five bedrooms, three bathrooms, a utility room with a washing machine and dryer, and a terrace overlooking the courtyard, providing peace and quiet, as well as privacy. The apartment is fully air-conditioned, and equipped with a security door and Wi-Fi.